So, what do you do when you have a client who decides to get married completely off the grid? Any good event planner will tell you, it will happen and you better be prepared for anything. Last year, our own Alicia Falango of Alicia K Designs was fortunate enough to work with a couple who decide to do just that - here is their story! 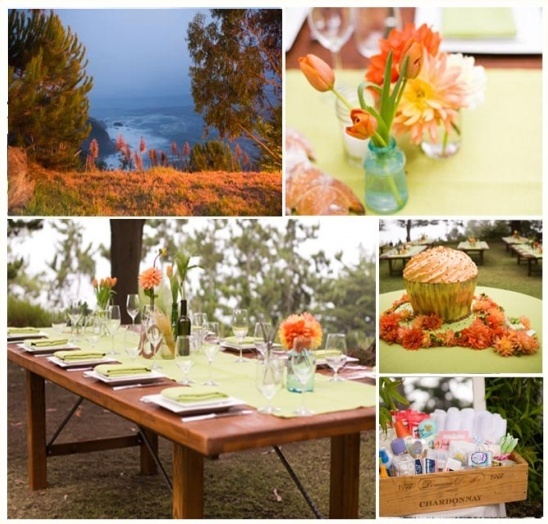 "The wedding location was a remote wooded ocean bluff along the Big Sur Coast (as part of a secluded private estate). It was gorgeous but it was also literally two hours away from anything resembling a town. In designing this event, we first had to think about building the architecture of the venue itself. Where would the ceremony go, reception, dance floor, lounge, etc? We literally needed to create a building without walls to make it work. We had to bring in lighting, bathrooms, heaters, water, and even generators to make it all work. We also had to plan a detailed transportation schedule, as all the guests were bussed in to the location itself and then many used golf carts to get out to the bluff. Once those logistics were figured out, we got to plan the fun stuff. As if the logistics were not complicated enough, the bride and groom were both living in London, so all the planning was accomplished through email and phone conversations. Their guest list was multi-national, with their guests flying in from all over the world. The wedding couple wanted their guests' comfort and enjoyment to be given the highest priority. Their goal was to create an environment that would allow their guests to feel welcomed, yet allow them to be immersed in the amazing beauty of the California coast."